People often comment that I have the best job in the world. And I always agree that yes I do! I am lucky enough to be doing what I love doing: creating, teaching and inspiring. I get to play every day and even though there are constant deadlines, I am having the time of my life! 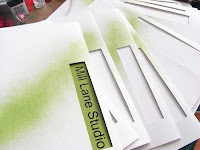 You might remember a recent post on how my studio had become a production line whilst I was preparing press kits and giveaways for the Summer CHA show. Well, today I'm really pleased to announce that my press kit for Mill Lane Studio won the CHA Designer Press Kit Award. It's a great honour to receive the award as it's voted on by the press from within the industry - people who get to see amazing, creative stuff every day. So to receive this award is like the industry applauding your creativity and I am just tickled pink to have been recognised this way. I have to come back down to earth tomorrow as there is work to be done but today, I am just going to enjoy playing for the sake of playing! CHA Day 3 and the show is winding down but there is still time to wander the floor to find new products. This morning unearthed two goodies; firstly an easy bow making template called Brilliant Bowmaker and secondly Silver Silk wire lace. I’m fortunate to have mastered making bows but I know that many people are bow challenged and this just might be the tool that helps you overcome that challenge. With this template, a few simple wraps will give you the basis of a double bow. Then you secure the pieces together - you can use a needle and thread, or as we did in the make and take, you can staple the pieces together. You don’t have to worry about them showing as they will be covered in the next step. 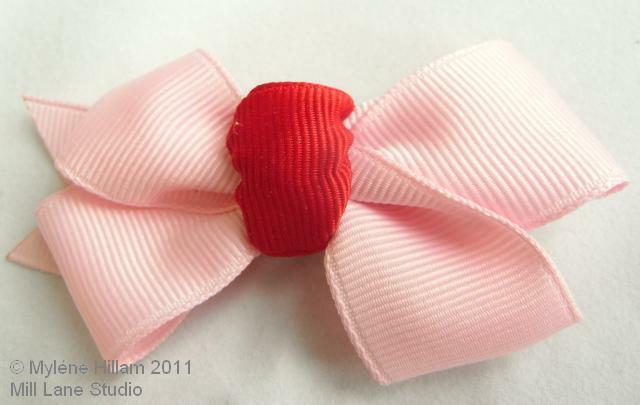 Finally, you take an additional short length of ribbon and wrap it around the centre, securing it with hot glue and voila, a very tidy double loop bow. 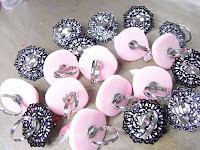 These are big enough for adorning shoe clips, head bands or even a handbag. 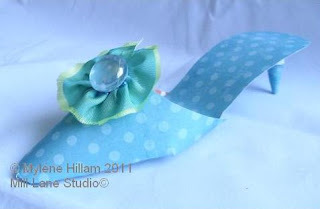 I'm sure you can think of lots of other places that could use a perfect bow! My second great find is Silver Silk, a knitted wire lace available in four widths: 1.5mm round, 2.2mm flat, 3.75mm flat and 4.8mm flat. And then there is Capture, a knitted tube that captures a ball chain inside. It's the black one in the image below. Notice how you the light catches on the chain inside the lace! 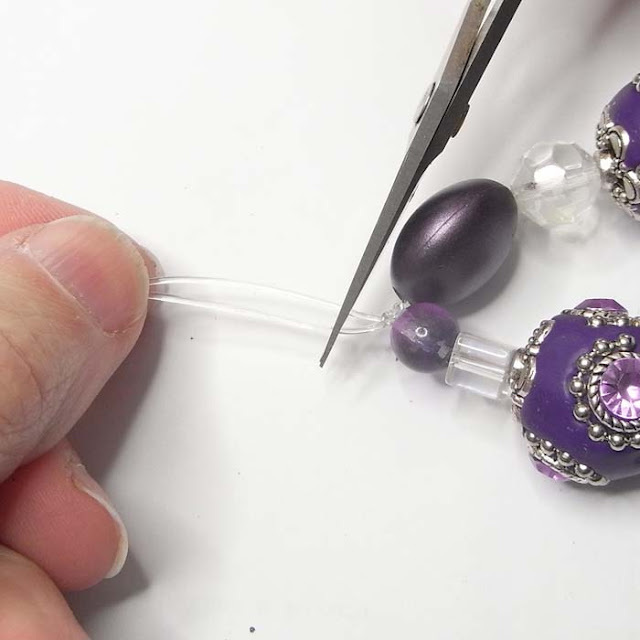 And cleverly, the manufacturer has also designed coordinating end caps in one, two and three holes to make your jewellery secure and give it a professional finish. There are several metal colours available as well as a range of non metal colours. 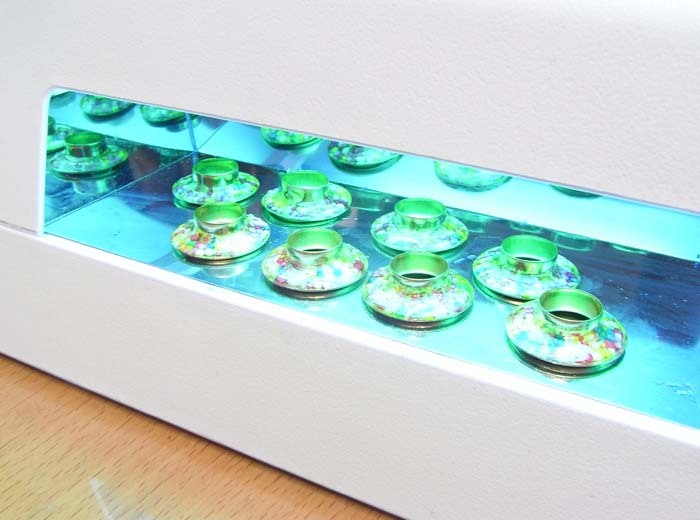 Check out the gallery on their website for ideas on how to use this fabulous new product. 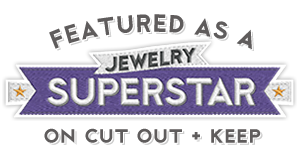 Immediately following CHA was the JF&A Show (Jewelry, Fashion & Accessory). Luckily, it is in the exhibition hall adjacent to CHA so I don't have to find my way around Chicago. When I walked into this show I was just gobsmacked – I have never seen anything like it: aisle after aisle of jewellery, beading supplies and fashion accessories. There was even a craft section for those of us who hadn’t had enough at CHA. For me though, it was straight to the bead suppliers where I found myself in bead heaven. I have truly never seen so many supplies together in one place and I would love to share a snap with you but I didn’t think to take a photo (and it probably wouldn’t have been allowed anyway!). But I can share with you some of what came home with me. By the time I packed it all into my suitcase, I was well and truly over the baggage allowance. Yes, my suitcase is truly heavy as both the hotel bell boy (who had to carry my bag down 8 flights of stairs because all the lifts were out of service) and the driver who had to lift it in and out of the shuttle will tell you. This show was quite an experience and I hear that it visits the convention centre four times a year. Wow, it must be so good being a beader in Chicago! Well, I’m leaving Chicago tonight and have just enough time for a trip to Michael’s craft store to stock up on some supplies. I’ll be back in Brisbane in a day or so and will hopefully be back in routine in a few days. 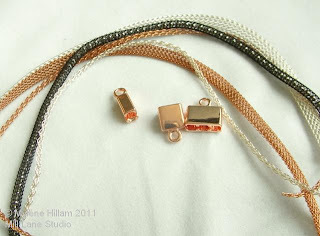 I hope you've enjoyed these little snippets from the new releases which caught my eye at CHA. I made my way straight to the other end where the new exhibitors were to make sure that I didn't miss them because I ran out of time at the Winter Show and missed a lot of the new exibitors. And I'm so pleased I did because I got to see some great new products. 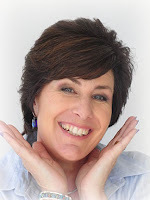 This first one is a really fun product and would be perfect for tweens and the young at heart. 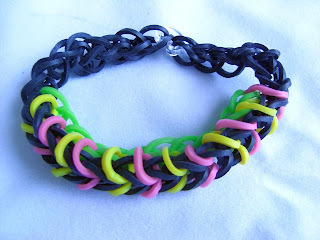 Twistz Bandz is a fun jewellery making kit. 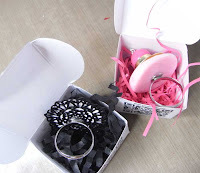 It comes with everything you need to create continuous link of rubber bands that can be made into a bracelet, ring or even a necklace. 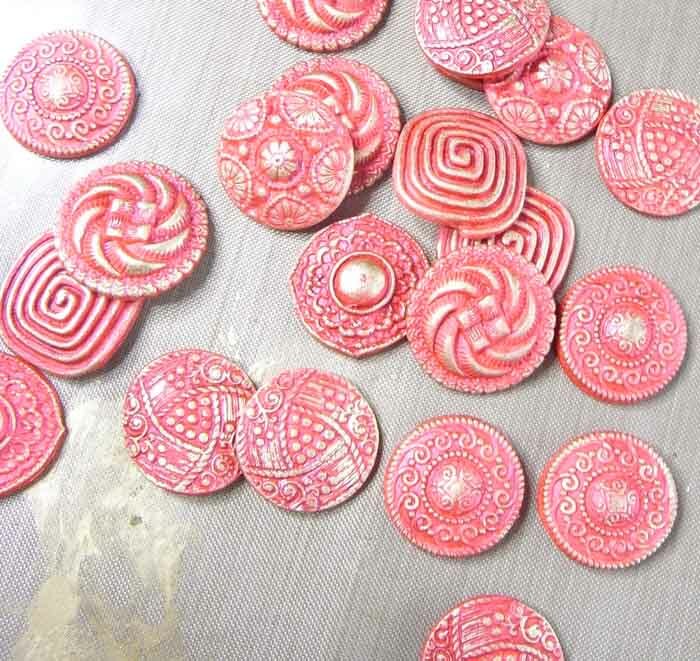 And I dare say, that you could easily put beads inside the woven patterns for added dimension. You get the jig, a supply of the specialty rubber bands, the hook tool to help you weave the patterns and clear instructions with lots of photos. 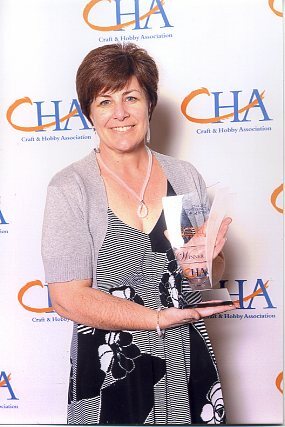 This product won an honourable mention in the CHA Innovations Award. 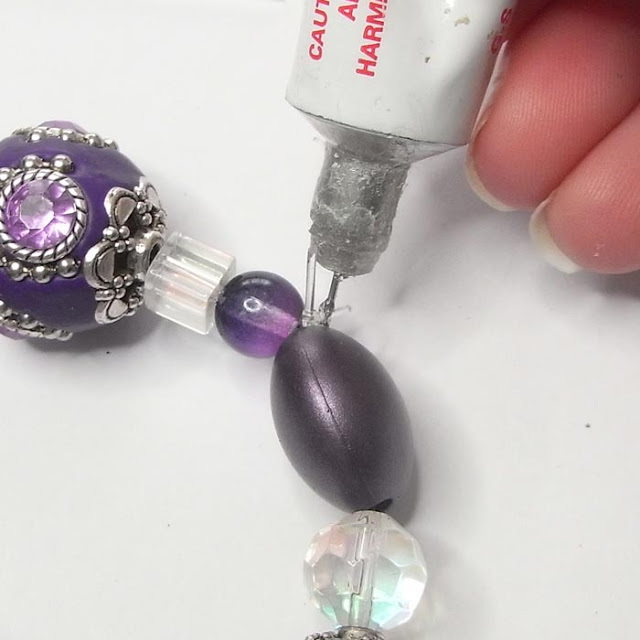 Next, I found a product that jewellery makers are going to love: Easy Earring Cards Punch Kit. 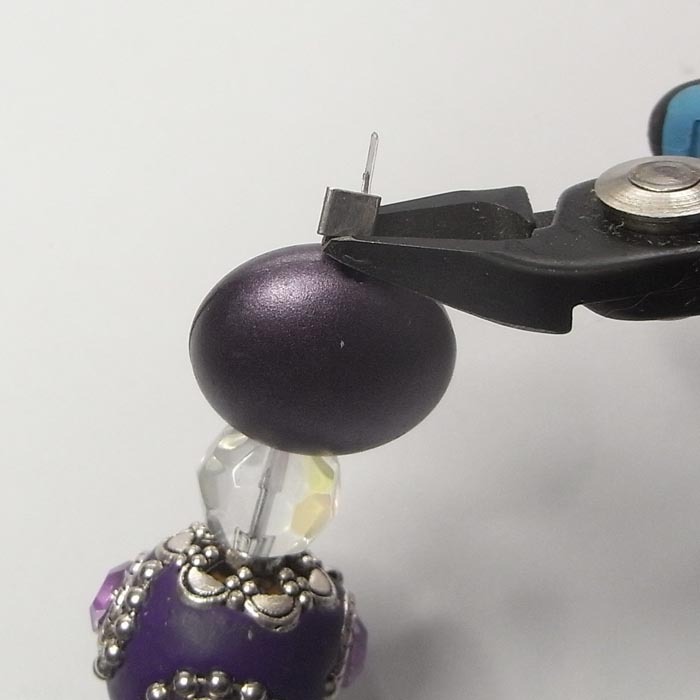 Whether you sell your jewellery or just love to giving your pieces away, this set of punches will turn any card into a professional looking earrings card. 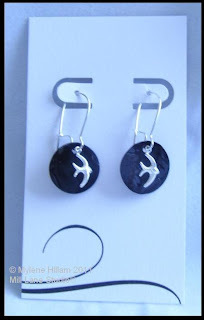 There are two punches in the set: one for hook earrings and one for stud earrings. I did a quick make and take (including the earrings) which took all of 5 minutes. Doesn't it look professional?! 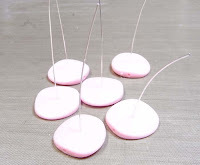 For scrapbookers and cardmakers, I found sticky back laces from Love My Tapes. No more fiddling around with glues and tapes to attach lace to your project. 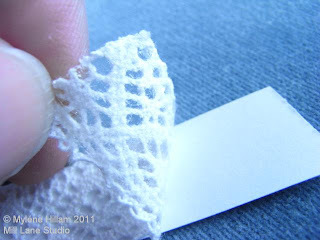 I love that idea, especially for lace! You can also colour it to coordinate with your project. And here's one for anyone in to memory crafting. 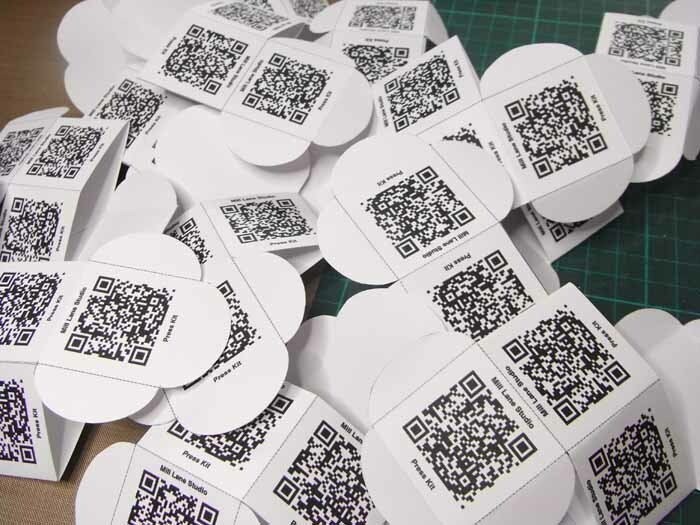 QR codes made a big splash at the Show with everything from labelling on products to webpage links but here's a use for them that will be useful in scrapbooking. This is a simple idea to combine scrapbooking with digital content. 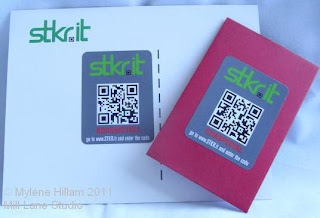 Here's how it works: visit their website, download the free app for your smart phone, purchase your STKR.it sticker and attach your digital content to the sticker. You can add videos, images or anything else you can think of and permanently attach it to the code. It can then be viewed by your family and friends on either a smart phones or computer. Sizzix celebrates its 10th Birthday this year and it has added some new dies and embossing folders to their range. Check out Eileen Hull's new line, Fresh Vintage. I'll be participating in a blog hop using her lace set embossing folder later in the year along with some other designers and I hope you'll check it out. More details to come. And lastly for today is a really cool make and take from Tombow. Marie Browning designed the project to showcase Tombow's range of adhesives: Mono Multi Liquid Glue, Mono Adhesive Removable and Mono Adhesive Permanent I'll be back with more show news later in the week. I hope you'll stop by. Another day draws to a close at CHA. Sunset from my hotel room tonight. Day 1 of the show is already over and I only managed to spend two half hours stints on the show floor between setting up my Designer Showcase and dashing off to seminars. But that doesn't mean I didn't have time to fit in some quality browsing. My best find of the day was at the Mark Richards booth. And that's an interesting story because on my way to the Convention Centre today I shared the lift with a lady wearing a stunning pendant that I couldn't help but comment on - it was truly eye catching. 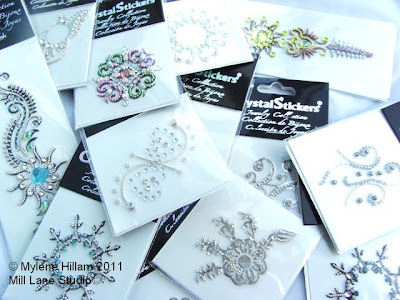 What I discovered at the Mark Richards booth was that one of their ranges - Crystal Stickers - was the wonderful component that made this lady's jewellery grab my attention. Jackpot! 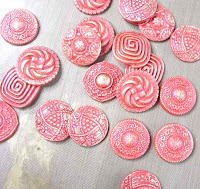 As you know, I LOVE pretty sparkly things and so I absolutely LOVE these! So, what's so great about these permanent crystal stickers? Well, apart from the great designs they come in, they will attach permanently to many different surfaces including wood, cardstock and shells without the application of heat. I'll be trying these on many other surfaces too such as leather and resin. Needless to say I was delighted to have found this product and you'll no doubt see some samples on my blog and perhaps even in classes later in the year. My second great find was Impress Art's metal stamp sets. I love using metal stamps in my mixed media work but I only have one very plain font in my collection. There are now 20 different fonts available. This is so exciting for anyone interested in mixed media jewellery because now you can personalise your metal, leather and wood with fancy script fonts as well as fancy print fonts. Some of these will be making their way home with me too and I see an excess baggage allowance bill on the horizon! I can't wait to see what Day 2 brings. Just a very quick post tonight. 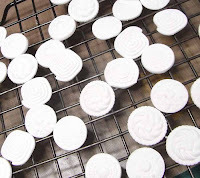 If doing one of my resin workshops has been on your "to do" list you might be interested to check out Totally Wild tomorrow morning to see what working with resin is all about. 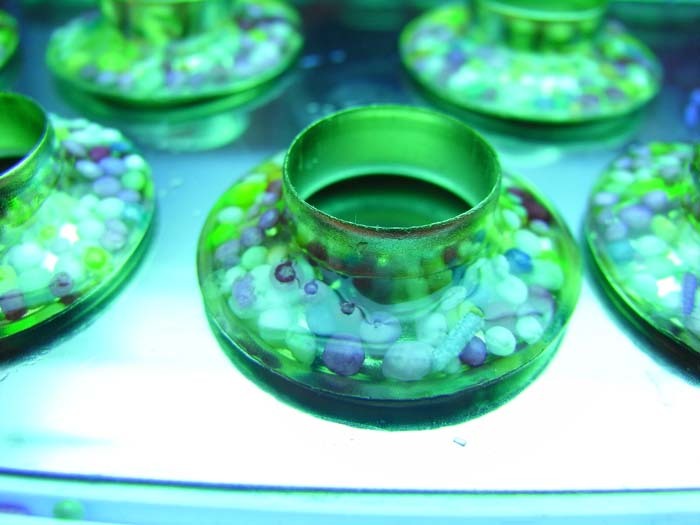 A couple of months back, I conducted a resin bangle workshop for Brisbane City Council's Art Bites program which was filmed by Channel 10 and it's being aired at 8am tomorrow. Sadly, I won't see it here in Chicago but for all you resin enthusiasts back in Australia, I hope you can tune in. 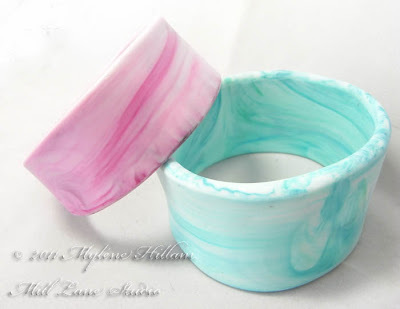 Bangle and Ring Resin workshops: August 20 and September 17. Well its just minutes until CHA begins so I'll be off now to check it all out. Let the fun begin! Next post, I'll be back with my first show report. CHA Chicago, Here I Come! Greetings from the Windy City. Anyone from back home will appreciate the lovely warm days that we are expecting here this week - warm, humid, low to mid 30s...... all in all, pretty much what we expect in Brisbane in Summer so this is a welcome relief from the rather chilly winter we have had this year. It was still light when I checked in to the hotel at 8pm last night so I had a bit of a wander around the area and took a few snapshots. It was great way to stretch out the legs after the long flight! 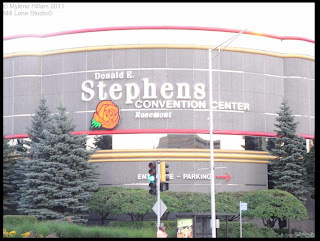 Corner view of the Convention Center. This is the view that greets you as you come off the motorway from the airport. It looks pretty impressive. 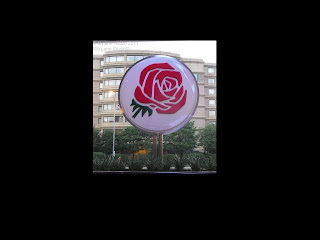 I love the stylised rose which is the logo for the Donald Stephens Convention Center This one is huge and stands in the drive through front entrance. 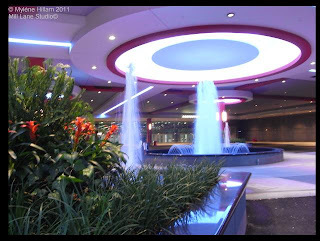 When I took this shot last night, the fountain was lit up blue, but as I left the Convention Center tonight, the water was a soft shade of red. I can't wait to see what other colours it changes to. It's lovely and cool when you walk out of the hot summer sun into this lovely shaded area. Today was Education Day which means lots of seminars, round table discussions and panel discussions. At the end of the day CHA and the local restaurants put on a wonderful spread of specialy finger foods called A Taste of Rosemont. Apart from the great food, it's a great chance to catch up with friends and acquaintances. The show doors open tomorrow and we're all eager with anticipation to see whats new products will be released in the coming months. I can hardly wait. I'll be back later in the week with more news from the show. My preparations for CHA are well and truly underway. Just one more sleep to go and I'll be jetting off to Chicago to the craft industry's premier trade show event, CHA. I'm still working on some projects that need to be finished and the only way I am possibly going to get things done is if I attack it production line style. Here's a few snaps of what I've been up to. Firstly, my press kits. They give the media and press identities an idea about what it is I do. As I do a lot of jewellery making and love incorporating mixed media into it, I've opted to incorporate one of my jewellery designs into the covers. Here's a look at some of the components. Recognise these? Check my banner at the top of the page! Cutting an opening on the cover of my press kits. A lot of work goes into putting a press kit together, especially when you don't have a PR department to do the work for you. Apart from the creative components that make up the press kit, there is also the copy that has to go with it. As a crafter, you want to spend your time crafting, right? Well, as a designer, this all comes with the territory. Next up, it's my little giveaways. 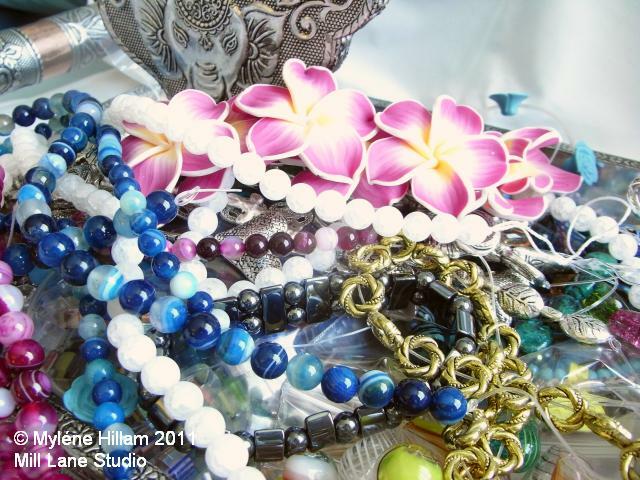 Visitors to my Designer Showcase will be able to take a little sample of my work home with them. Every one loves to get little freebies at the show...... it makes the whole experience just that much more fun! Cooking UV resin! These will be assembled into rings as giveaways. It's like peeking into the oven to watch a cake rise! You know, the light really doesn't look blue when it's on, but it always photographs that way! I couldn't find a die to cut these with so each one is hand cut. Ask me about how my hands feel! Presentation is everything at a show like this. You didn't really think I was going to show you the rings. That would spoil the surprise for the recipients if they could see them in advance. 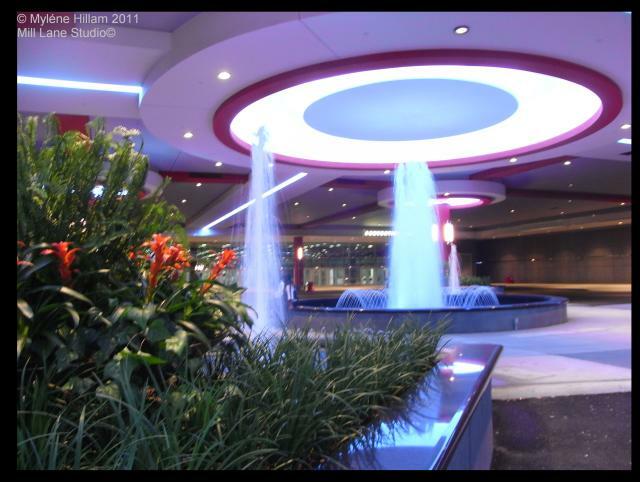 It's all part of the discovery of the new designs and ideas that designers bring to the show. Maybe one day I'll share how cute these little rings look. I hope you've enjoyed the little peek into my preparations. Now it's a matter of getting it all packed up so that it survives the journey across the big pond. Stop by later in the week and I'll share some of the wonderful new things released at Summer CHA. Have a happy crafting weekend! And that makes the winner Debbi Baker. 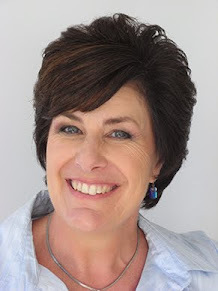 Congratulations Debbi. 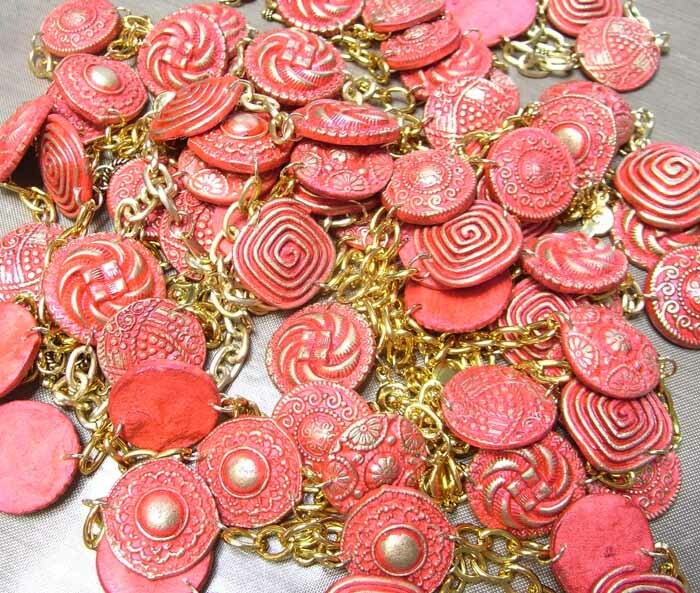 Send me your postal address and I'll have the beads on their way to you. Well, it's back to the production line for me. I'm really big on trying to make a little time for crafting every single day. 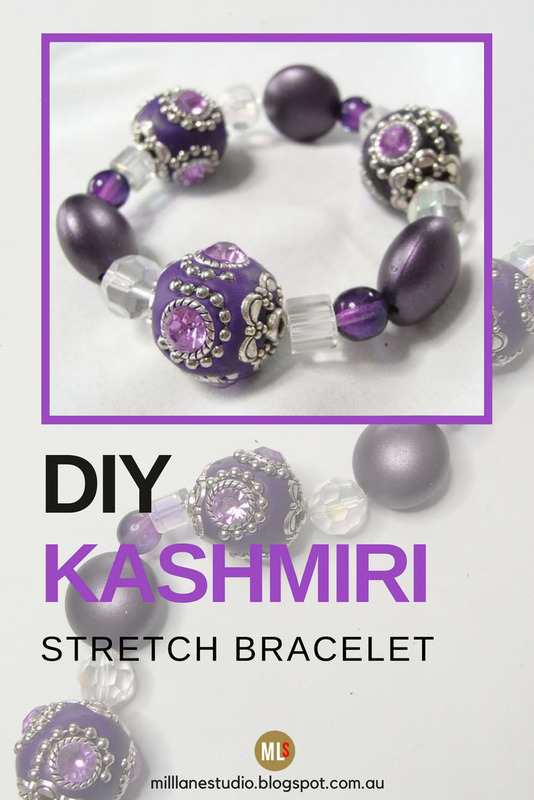 We are all very time challenged these days and sometimes our busy lives give us only a few short minutes to spend in our crafting area and that's where today's project comes into it's own - a bracelet you can make in just minutes and with only a few materials and no jewellery making skills. Begin by removing the beads from the beading wire that they came on. 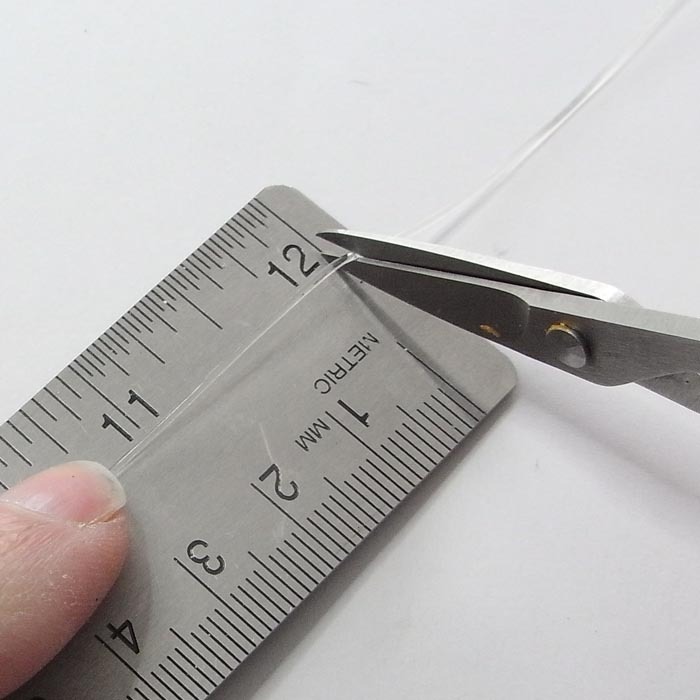 Don't use your good scissors for this as you will nick the blade (I prefer to use my flush cutters). 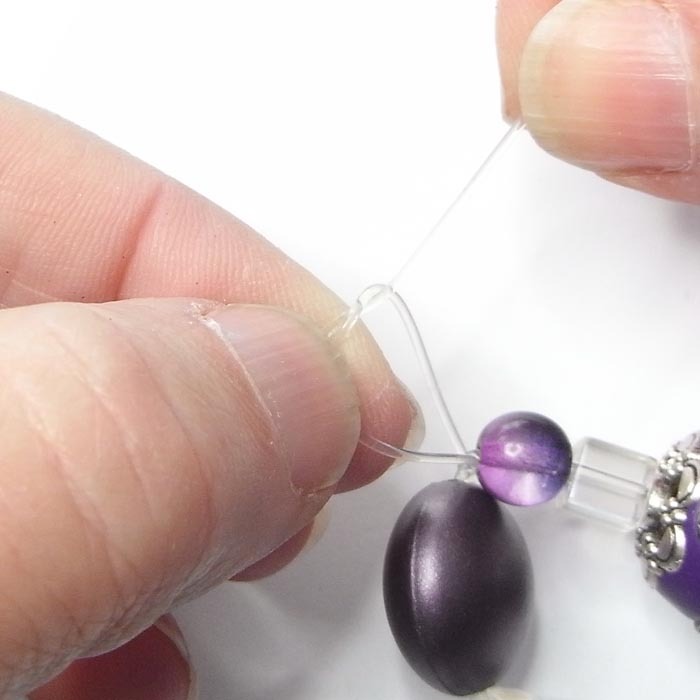 You can rearrange the beads if you like or just keep them in the pattern on the strand. Jesse James' designers do a great job of selecting bead combinations so for this project I am happy to go with them just the way they are. Cut a piece of Stretch Magic the length of your wrist plus 10cm (4"). About 30cm (12") is a good length to work with. Pre-stretch it by holding the elastic at each end and pulling it firmly three or four times. 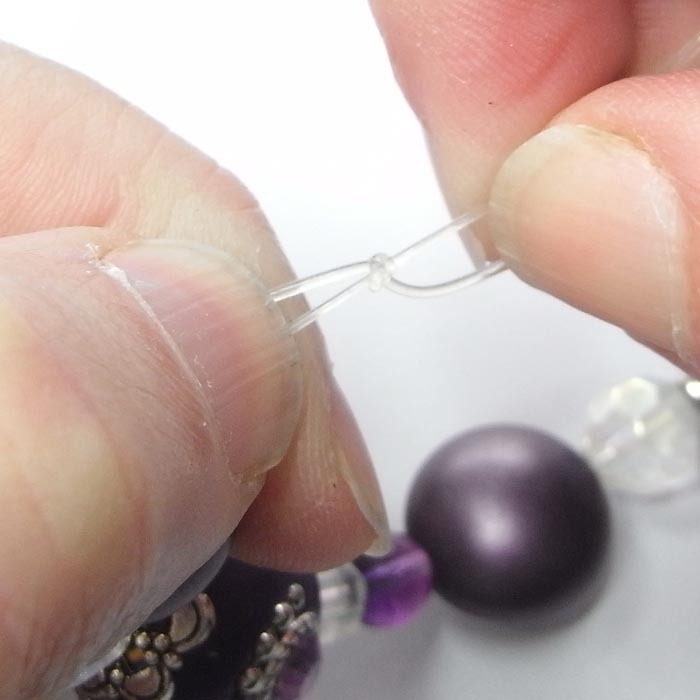 This will help overcome the problem of the bracelet stretching after you've worn it a few times. Place a beadstop on one end (or tape the Stretch Magic to your workspace) and thread on the beads. 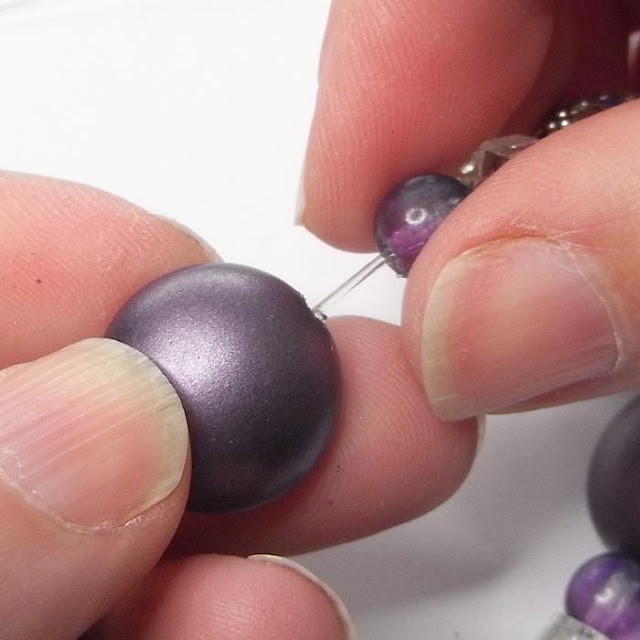 Tip: Make sure that either your first or last bead is a large holed bead. That way you can hide your knot! To tie the knot, place one end over the other and tie a half knot. 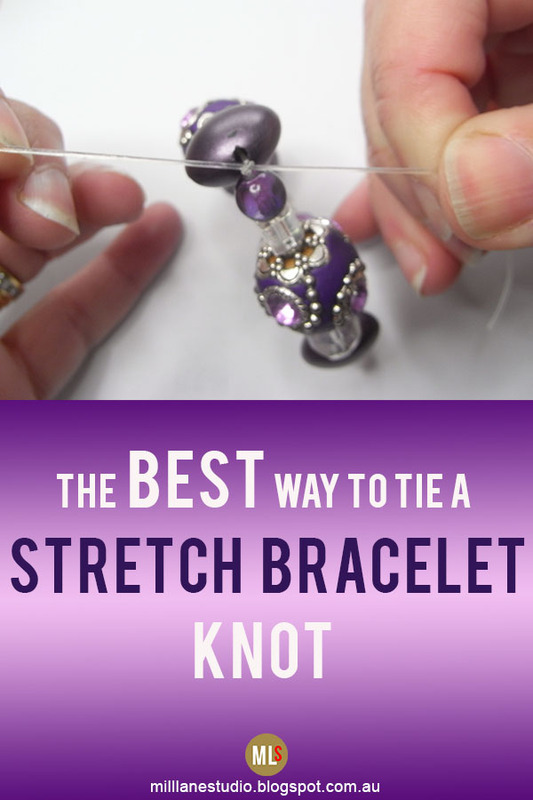 Tie a second half knot and pull the knot tightly. Tie another knot and pull tightly again. Repeat two more times, making sure you pull the knot tightly each time. 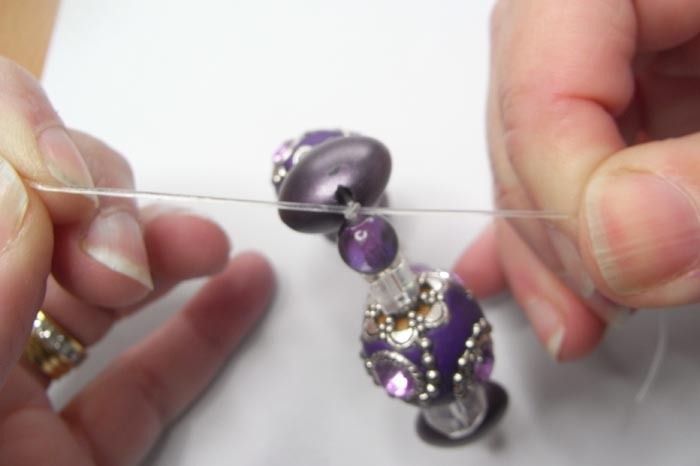 Place a dab of glue on the knot and trim the ends of the elastic to about 6 or 7mm (1/4") and then slide the knot inside the large holed bead. 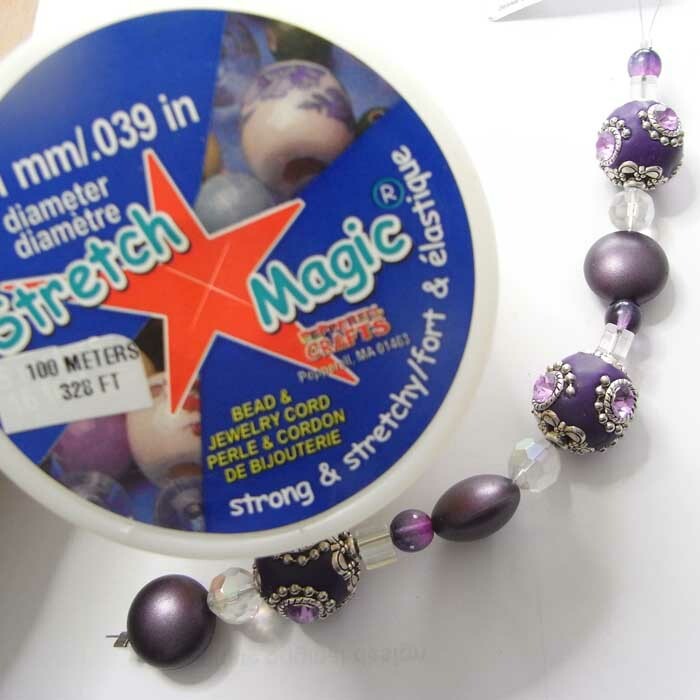 I've found this method to be the most successful way to tie off Stretch Magic. You can see a video on how to do this here: https://youtu.be/pkz-Z8eo0VM. And there you have it - a quick but stunning bracelet! Since my last post on Kashmiri beads, I've been contacted by a number of people who have asked where I found my Kashmiri style beads. I even had a gentleman from Spain who wanted to gift them to his wife for her birthday..... isn't that so thoughtful! 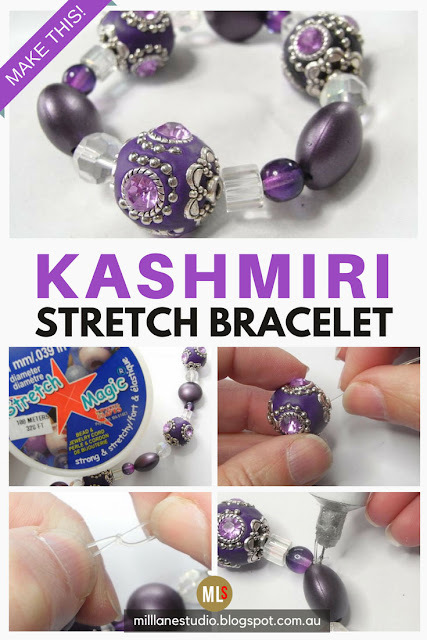 So it seems that these opulent, over-the-top, almost gaudy Kashmiri beads are gaining in popularity and I've noticed they're popping up in a few more places both online and in shops. 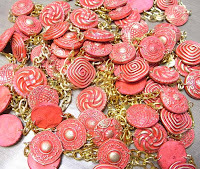 The range of colours and designs becoming available is also increasing. So I thought I'd share two of my favourite online sources with you. All the beads in my earlier post came from Stamp Antics. 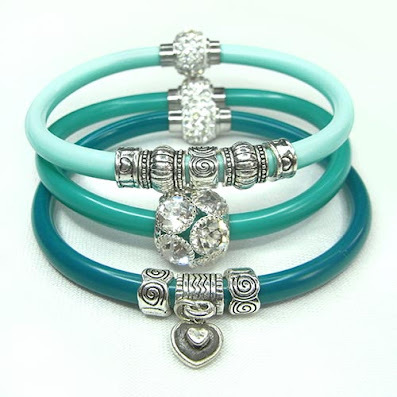 They come in strands with coordinating beads and they are long enough that you could just thread them onto Stretch Magic, tie off into a secure knot and you'll have a stunning, yet simple bracelet. 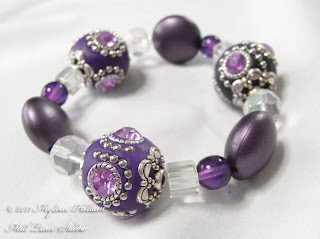 You won't find the beads listed on the website yet as it's still under construction but send an email to Jenny (info@stampantics.com.au) and she will get back to you. 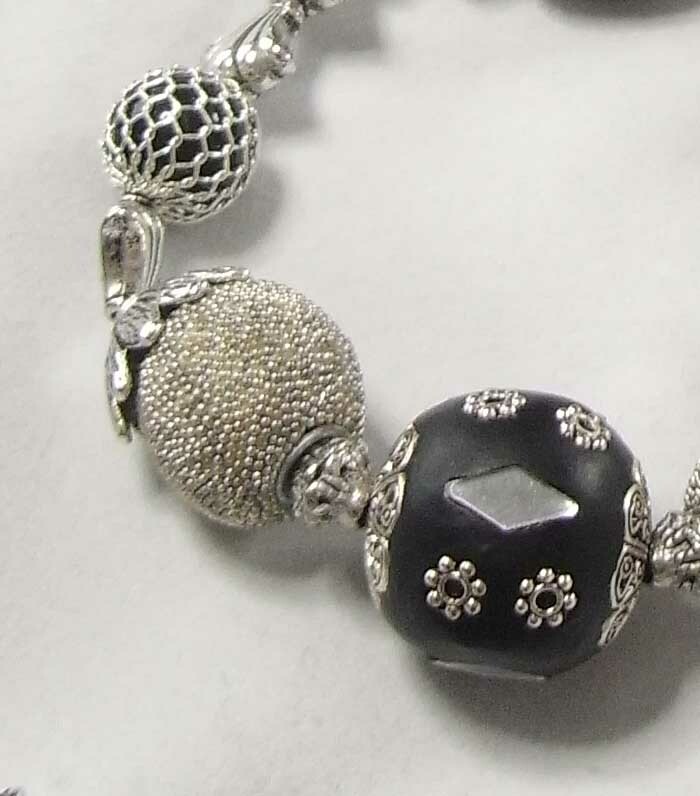 My other favourite online source for Kashmiri style beads is Beads Online: www.beadsonline.com.au. 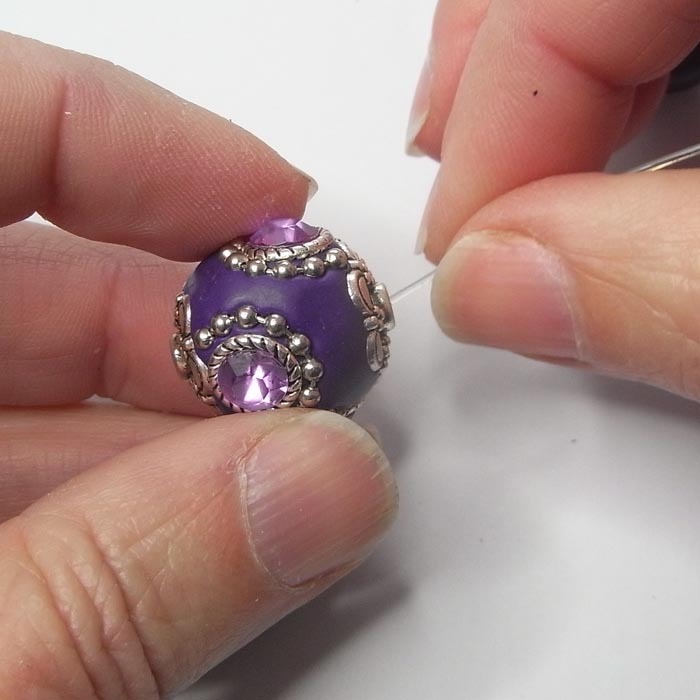 The beads are available unstrung, in either small lots or as individuals. Judith's service is excellent.... my last order arrived next business day! Now it's time for a give away. For your chance to win some Kashmiri opulence, leave a comment at the bottom of this post and you'll go into the draw. I'll draw a winner randomly on Wednesday evening (Brisbane time), 13th July. The winner will receive one pre-strung strand of Kashmiri beads of my choice. Don't forget to leave your contact details so that I can contact you if you're the lucky winner. 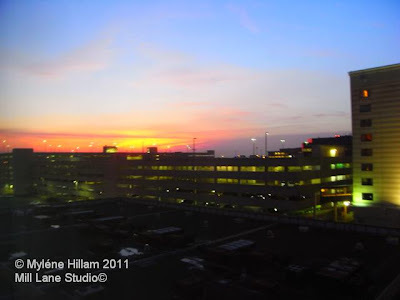 For Hive and Facebook readers, please click here to leave your comment.